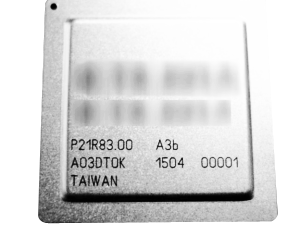 Laser marking process has become the latest Electronics Industry standard. 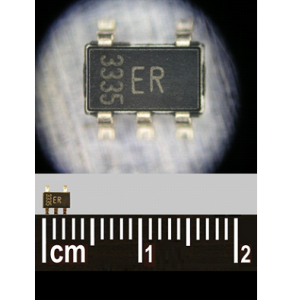 As a lower cost alternative to Ink Marking, and for better mark permanency, the Industry has embraced the Laser marking process as the marking choice for integrated circuits. Prime has excelled in the development of extensive laser marking programs tailored to various challenging package sizes and types. Laser marking is performed on multitude of substrates, plastic, metal, silicon and more. Some of the common Applications include: Complete marking of logo's and device information, or "Add Marking" for post-test binning. Serialization of products both alpha numeric and ID Matrix formats. Prime utilizes both 1064nm , and 532nm wavelength Laser system for marking various types of materials. 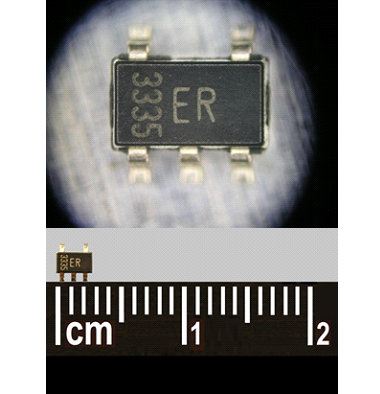 Our 532nm laser is specifically designed to mark FCBGA's or other bare silicon products. 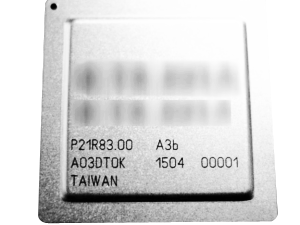 The above HCBGA sample was laser marked and serialized per customer’s specifications. The above device (1.5 x 2.5mm) was laser serialized. Due to the limited area for adding the serialization, and the uneven size characteristics of the device (mold flash), prime utilized in-house designed tooling to accomplish precision marking in the limited space.